Hello blog world. I'm back with an update for Furniture Fashion. Check out my post called "5 Unique Aquariums from Opulent Items." 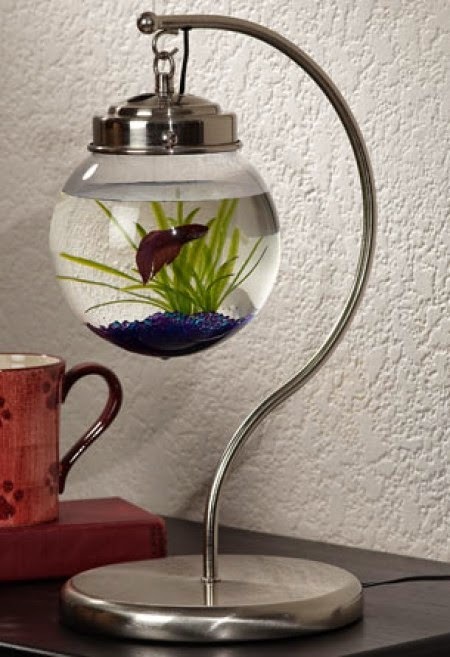 I love the circular little desk aquarium below. Click the link to read the full article. In other news, I've been super super busy with school lately. I've had classes in Germany and then on Monday I just got back from a class in Spain. So expect all of my upcoming posts to get a little hotter. I'm talking 90 degrees hot and I am in shock coming from the Spanish hot sun to the German rain. Also, this weekend you can check out my instagram to get sneak peaks at my upcoming trip to the Nurnberg Flea Market which I go to twice a year. What have you been up to lately? *Comments have been disabled for this post so you can visit the original article. Thanks!